Kindle Oasis is the thinnest and lightest Kindle, with ergonomic design, a premium leather charging cover, and the highest resolution of any e-reader. Amazon’s Kindle Oasis is a device nobody needs. It’s a $289.99 eReader that offers a premium version of an activity most of us are accustomed to doing for free. And the Oasis is costlier than existing units you may already have in your home that offer a similarly lavish approach to reading. It is, however, the first of Amazon’s long line of Kindles that impresses the moment it’s removed from the box. The Kindle Oasis feels like the expensive device it is, with mostly clever design choices that will make it the superior way to experience text in 2016, for a certain audience, anyway. That audience is affluent, book-obsessed and traveling near constantly. The Kindle Oasis owner understands the value in putting the smartphone down to focus on leisure when appropriate. It is a person who will not compromise with a substantially cheaper, mildly dated alternative. This person might even be moneyed enough to join Amazon CEO Jeff Bezos on his spaceship, blasting off to leave us behind with our dusty old eReaders. If this is not you, put the device out of your mind. Our planet is littered with technological detritus; you are not making things better by encouraging further iterations of mostly fine and by-definition redundant gadgets that make you mildly more comfortable when reading a book. That said, the Kindle Oasis is absolutely recommendable to some people. It’s a good enough device to define the eReader category as the iPhone is a benchmark for smartphones. This is the Kindle that future eReaders will be judged against. The Oasis is small and dense. It’s crafted to rest and function in one hand. One slightly accentuated side makes the device easy to grasp, so your free hand can hold a subway pole or scratch your cat’s head. And because the screen rotates, you can grip the extra-wide bezel with either your left or right hand. Previous Kindles weren’t exactly impossible to hold, but this is superior design, a basic instance of form evolving to match function. The display is perfect. How much more perfect than your smartphone’s screen, we cannot say. The Oasis does what Amazon’s own Kindle app on iOS or Android does: It displays eBooks with crisp, customizable fonts and margins. 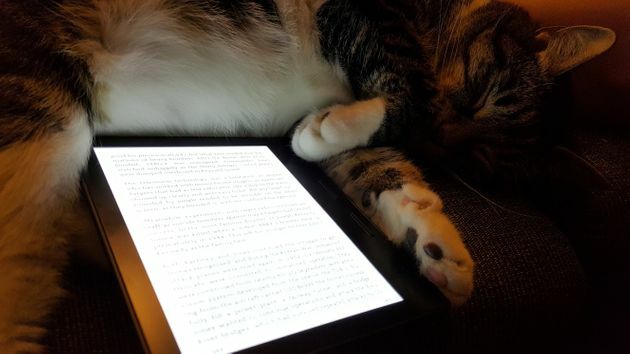 Its resolution matches some older Kindle devices, but the Oasis contains more LED lights to supposedly create a more even, readable glow when you’re paging through books in the dark. We have no complaints about the light on previous versions, but sure, this is nicer. This is the Kindle that future e-Readers will be judged against. There are flaws. As with previous models, the touchscreen design is clunky. You can tap on the screen to flip pages back and forth, but you also need to tap it to access options on the device or change your book. There are discrete parts of the screen that correspond to certain functions, and of course nothing visually sections them off when you’re reading. Tap the wrong area — and if you’re like us, you will — and the Oasis might flip a page when you meant to visit your home screen or vice versa. Even after all this time, with so many old Kindles filling drawers and landfills, the touchscreen functions are not intuitive. Amazon has included two physical buttons on the outside edge of the device to turn pages if you don’t like the touchscreen. The tactility is nice, especially for those accustomed to printed books, but the buttons suffer from ungraceful design. You read a paper book by turning pages to the left and right; these buttons are positioned one atop the other. Like the touchscreen, this design is not intuitive. By default, tapping the top button moves you forward, while the bottom button moves you backward. Also Read Our Article : Amazon’s $289 crazy thin Kindle Oasis has a battery cover that adds months of Charging. Amazon seems to have expected this would confuse some people, because you can change which button does what in your settings. There are other attributes to the Kindle Oasis that aren’t particularly notable. It weighs slightly less than previous Kindles. Its battery, Amazon says, will now last for months, due in part to an included leather case that provides additional juice when it’s snapped into the Oasis. The device looks sleeker and feels nicer without that case attached, so you might leave it behind — a shame since it probably accounts for a decent portion of the $289.99 asking price. Is the Kindle Oasis worth $289.99? The answer is yes, if you do not have a recent eReader, if money is not particularly an object in your life, if you read a lot of books and if you commute with frequency. It would be a mistake to purchase this otherwise. The reason why is fairly straightforward: It would just be a waste. eReaders are a weird, singular category of consumer technology that exist almost entirely as luxury. They are not inherently better than the printed books they replace, and they are quickly becoming eclipsed in function by the smartphones most of us carry around. Roughly the same page of the same book viewed in the Kindle app on a Samsung Galaxy Note 5 phone and the new Kindle Oasis. The Kindle device will be easier on your eyes, but are you willing to pay for that? 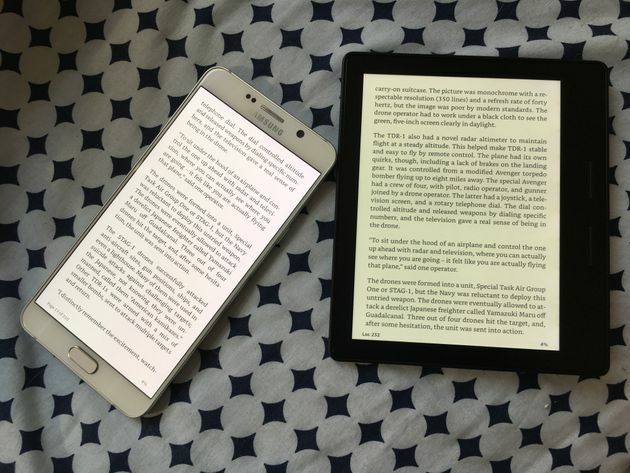 There are a couple of times when any Kindle device — not just the Oasis — will outshine Amazon’s Kindle app on your phone: When you are reading in direct sunlight and when you are reading before bed. The screens display perfectly under the sun’s rays or a lamp with a sleep-friendly bulb — not so with your phone. If you do not find yourself reading in those circumstances often, Kindles just aren’t worth it. But somehow, our appetite for new gadgets means Amazon and companies like it will continue to iterate and release mildly upgraded new hardware to seize our money and eventually get tossed out. The innovations are slowing: Kindle Oasis is likely the best eReader you can buy, but it is mostly a new shell for existing technology. In all likelihood, you can make do without it. That’s not to say no one should buy it. The rest of us, though, should reconsider why we want these gadgets and what, if anything, the constant upgrades are contributing to our lives. UHive ICO: Blockchain Social Network Crypto Coin?